Blue Asset Tags (#s 65,001 – 90,000 & 500,000 – 899,999) are placed on computers and mobile devices purchased by DTS as part of the Learning Technology Plan. DTS fully supports this equipment until it is deemed End of Life (EOL). At EOL, the equipment is recycled or sold to the public and DTS purchases replacement equipment as specified in the current Learning Technology Plan. Purple Asset Tags (#s 900,000 – 900,999) are placed on computers and mobile devices purchased by Assessment. DTS fully supports this equipment for the duration of the manufacturer’s warranty. At the end of the manufacturer’s warranty, DTS will continue to support the device until EOL, but the costs for repair and/or replacement is the responsibility of Assessment. At EOL, the equipment is recycled and it is Assessment’s responsibility to determine if replacements will be purchased. 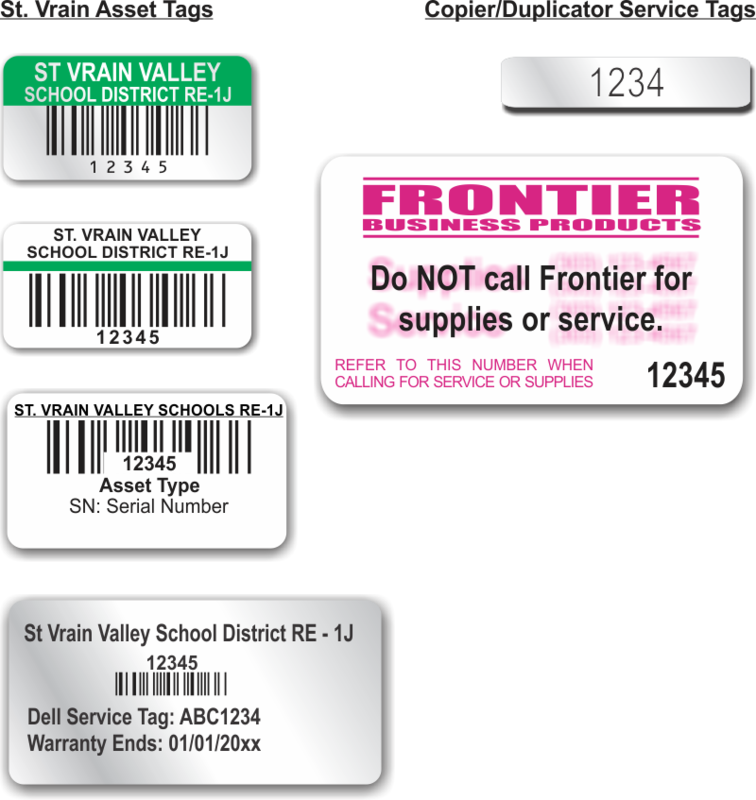 Red Asset Tags (#s 90001 – 499,999) are placed on computers and mobile devices purchased by schools and meeting SVVSD technology standards. DTS fully supports this equipment for the duration of the manufacturer’s warranty. At the end of the manufacturer’s warranty, DTS will continue to support the device until EOL, but the costs for repair and/or replacement is the responsibility of the school. At EOL, the equipment is recycled and it is the school’s responsibility to purchase the replacement equipment. Green Asset Tags (#s 10001 – 65000) are placed on network switches, printers, copiers, servers, UPS etc. purchased by DTS. Technology or devices that have the green tag are for DTS’ inventory purposes. Technology and devices purchased by DTS prior to September 30th, 2013 that have these tags may qualify to be refreshed by DTS. DTS keeps track of the devices that qualify for refresh. DTS is no longer using green tags to inventory devices such as computers, iPads, Chromebooks or devices that are part of the Learning Technology Plan. Desktop Computers/Thin Clients – Asset tags are usually positioned on a vertical side of the computer case. Laptop Computers – Asset tags are positioned on the bottom of the laptop. Mini Computers – Asset tags are positioned on the case so they are visible when the computer is placed in a mounting bracket. iPads – Asset tags are positioned in the middle of the back of the iPad. All technology and devices that are deemed abused or damaged due to negligence will be the school’s responsibility to pay for the repairs. Schools wanting to purchase equipment that is not part of the Learning Technology Plan must receive written approval by Chief Technology Officer before purchasing technology. Some Dell computers have white on black asset tags.